Similar to humans, dogs and cats may gradually become overweight over a period of months or years, in response to a relatively small, but prolonged, energy imbalance. This imbalance is as a result of more energy being taken in than expended. There are numerous health risks involved for dogs and cats that are overweight. The most important and serious conditions are: diabetes mellitus, exercise and heat intolerance and orthopaedic/joint problems. Overweight dogs and cats are also susceptible to respiratory and heart conditions, and cats can also struggle with self-grooming. How do I tell if my dog or cat is overweight? A useful tool to determine whether your dog or cat is overweight is a body condition score chart (BCS). A BCS chart is a useful management tool which uses a numeric score to estimate the degree of obesity. For an ideal BCS, you should feel a thin layer of fat covering the ribs, allowing you to easily feel and see the ribs. If you feel a thick layer of fat and have to press down hard to feel the ribs, then your dog/cat is likely overweight or obese. Identifying and changing habits that may have contributed to the pet’s weight gain is key to successful weight loss. A protein-rich, carbohydrate-limited diet is essential for effective weight management. When deciding on a suitable diet, there are a few things to consider. Ideally, the diet should aim to decrease body fat and maintain lean muscle mass. Overweight dogs and cats often suffer from mobility problems, so the weight-loss formula should also offer some joint support in the form of glucosamine, chondroitin sulfate and good levels of animal Omega 3 fatty acids. The diet should offer limited, low-glycaemic sources of fruit and vegetables for sustained energy release throughout the whole day. Good sources of fibre for satiety and general intestinal health are also important. 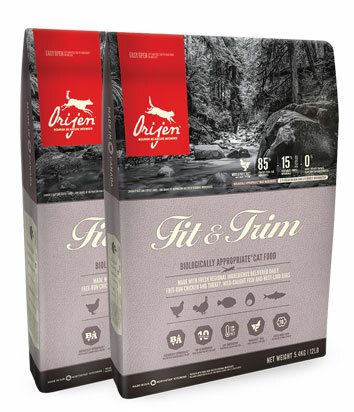 ORIJEN Fit & Trim Dog and Cat formulas offer all these benefits as an 85% meat diet, with 2/3 fresh meat ingredients and more than five different sources of meat in WholePrey ratios, which reduce the need for synthetic supplementation. Unlike any other weight management food on the shelves, ORIJEN Fit & Trim is a stand out in its category. With unmatched inclusions of nourishing animal protein to support lean muscle mass and a formula limited in carbohydrates and calories, Biologically Appropriate ORIJEN Fit & Trim promotes peak conditioning for overweight dogs and cats.